Is it possible to hack the 1.31 board to have the thermistors always on? Now on the 1.4 board the thermistor circuits are powered by 5V standby, so firmwares like marlin and sprinter which do a sanity check don't throw an error. The only workaround as of now it to jumper the atx supply (jumperwire green to ground). if it would be possible to cut a trace and solder a wire to power the thermistor circuits with 5Vstandby on a 1.31 board some people might choose not to upgrade/ sure you loose out on extension capabilities, however this hack would be good for those of us that currently don't have the funds to spare to upgrade. 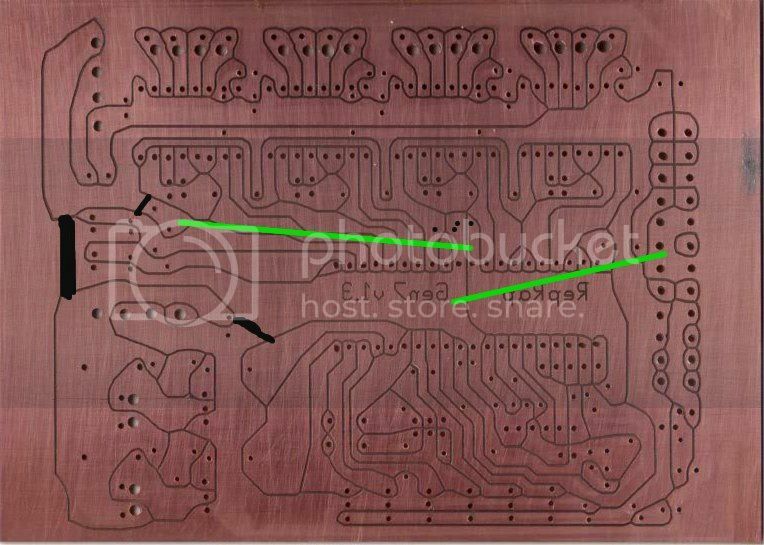 it should be a simple matter of cutting a trace and adding a wire from the 5Vsb supply. Could we get some instructions? or comments why it would not be a good idea? Edited 1 time(s). Last edit at 07/13/2012 03:08PM by terramir. Re: Is it possible to hack the 1.31 board to have the thermistors always on? 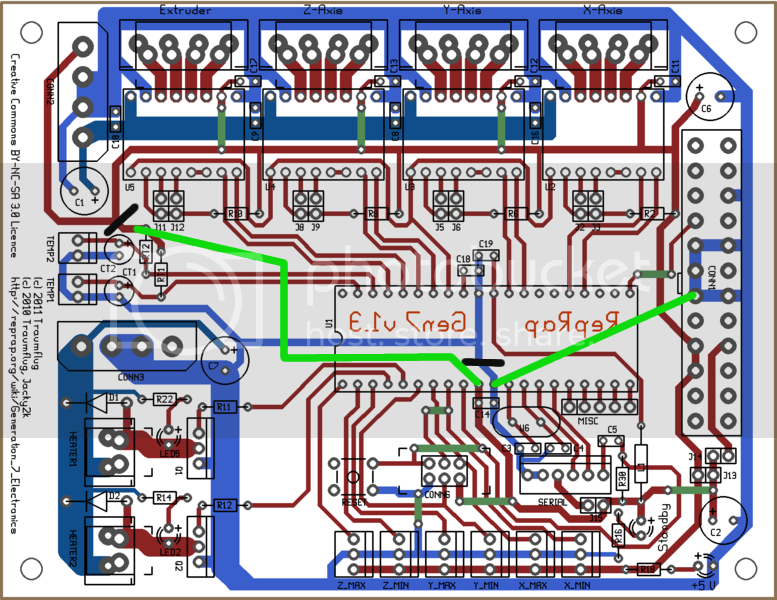 The thermistors should be powered from the AVDC pin on the micro with a track that is not shared, otherwise you get inaccurate results. so still what I can't figure out this hack right there wasn't that the ground fix that solves various problems, however this is not what I was looking for, what I was looking for was a hack in regards to the powering of the thermistor circuits. I need them always on i.e. powered by 5v vsb, currently on the 1.31 board they are turned off i.e. reading out of range unless the power supply kicks in (so you have to jumper the power supply in marlin and sprinter (green to gnd hack) I want to make them read all the time. can someone chime in on this and explain to me a little further, cause if I follow the tracks right there in this hack it just seperates the ground planes while this might help with accuracy it still wouldn't turn them on when the power supply is not triggered. You have to hack the connection to the resistors and connect it to the AVCC pin on the micro. It both makes them active whenever the CPU is powered and also improves the accuracy. can you put that in a picture of the 1.31 circuit so I can understand what pins that is going to be ? although a write-up for other gen7 owners might be nice as well so they can do this too. No the resistors should be connected to the AVCC, pin 30. It is also powered from VSB via L1. I think the ground cut should be near C7, not where you have it. The mods have been published in this forum before, see [forums.reprap.org]. What I don't understand is that that picture also shows V1.3 but it doesn't look like yours. Also it doesn't look like these mods are in the latest V1.4. The ADC takes its reference voltage from AVCC. The thermistors should be biased from the same voltage so that any supply voltage change is cancelled out. Also thermistor ground should not share traces with power ground. They should starpoint near to the CPU GND pins so that ground current does not cause a voltage offset. Yes that looks good although it is probably not a lot different to making one cut at C7 and putting the link to ground from the 24way to the mid point between the ground pins making a star point. Edited 1 time(s). Last edit at 07/14/2012 05:19AM by nophead. So do it like this ? Edited 1 time(s). Last edit at 07/14/2012 05:55AM by terramir. Edited 1 time(s). Last edit at 07/14/2012 08:59AM by Traumflug. Did this, and it works perfectly. Thanks! I come to "hack" my Gen7 1.3.1 board as you indicate in this thread (my board is reversed compared with the Terramir's photography but not too hard to recognize the good areas ) and it is working perfectly : now i can read the temperatures without sending a command to awake the board. Thank you very much for your sharing.